Every resident of the Parish of Newton has had the opportunity to contribute their thoughts and ideas to the first Newton in the Isle Village Plan. A steering group of local volunteers devoted almost a year to devising a detailed survey on all aspects of village life, which was distributed to every home in the Parish during September. The completed surveys are currently being analysed and the results will be published shortly. A summary of the initial responses is included in the leaflet below. The responses to the survey will be used to help plan for future development and service provision. The survey covers a broad range of issues, such as housing, transport, development, infrastructure, amenities, environment and council services. Should we change the name of the village, install a wind turbine or switch off the street lights? All this and more is up for debate and everybody's opinion will be listened to. The Village Plan is supported by the Parish Council, who have secured lottery funding to cover the costs of preparing and printing an information leaflet and the survey, as well as collating and publishing the results. 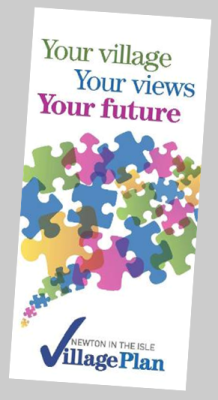 To find out more about the Village Plan and what it means for Newton, click on the links below to read the leaflet, the survey and the summary of responses.